Pediatrics is defined as the science of a healthy and sick child from birth to end of adolescence. Diseases of the cardiovascular system are the leading causes of mortality in adults, with frequent onset in childhood. The cardiologic examination starts with anamnesis in a pleasant atmosphere, refined space, enough time and patience, detailed measurements, and preferably a noncrying child. Anamnesis, regardless of the development of diagnostic procedures, still constitutes the basis of every clinical examination. The basic characteristics of pediatric cardiac anamnesis are comprehensiveness, that is, details, clarity, concurrency, and chronology. Proper and conscientiously taken anamnesis with a thorough clinical examination of a sick child is a solid protection against dehumanizing the relationship between a physician and patient. Pediatric cardiac anamnesis can be variable, completely negative, but very rich. Anamnesis should, first of all, clarify whether only a child is sick or it is perceived like that be his or her environment. Preschool and school-age children are normally attending anamnesis. High-quality, comprehensive medical history can keep the patient at one level of health care, with a strict focus primarily on the diagnostic processes, reduce crowds in specialist and subspecialist institutions, and make economic savings. A large number of patients in specialist and subspecialist clinics can be reduced by proper screening and by developing primary health-care system (from the local health-care center). Taking patient's medical history with thoroughness has a strong educative character for young doctors at the beginning of their careers. Pediatrics is defined as the science of a healthy and sick child from birth to end of adolescence. Diseases associated with the cardiovascular system are the leading causes of mortality in adults, with frequent onset in early childhood. The cardiologic examination starts with anamnesis in a pleasant atmosphere, refined space, enough time and patience, detailed measurements, and preferably a noncrying child. The clinical cardiology examination uses a default inspection, palpation, percussion, and arterial blood pressure measurement. The introduction to the physical examination is a true measurement and comparison on the percentile curve of the body height and weight, although it would be advisable to measure both the head and thorax circumference., Although additional diagnostic methods can be used in the treatment of the patient, their use is often questionable and not useful, mainly due to poor patient treatment at the initial physical examination step in taking anamnestic data. To provide a review of the significance and characteristics of pediatric cardiac anamnesis and to point out the significance of anamnesis in the differential diagnosis of pathological conditions, as well as to reduce the number of additional unnecessary specialist and subspecialist services. The basic characteristics of pediatric cardiac anamnesis are comprehensiveness, or details, clarity, concurrency, and chronology. Proper and conscientiously taking an anamnesis with a thorough clinical examination of a sick child is a solid prevention against dehumanizing the relationship between a physician and patient. 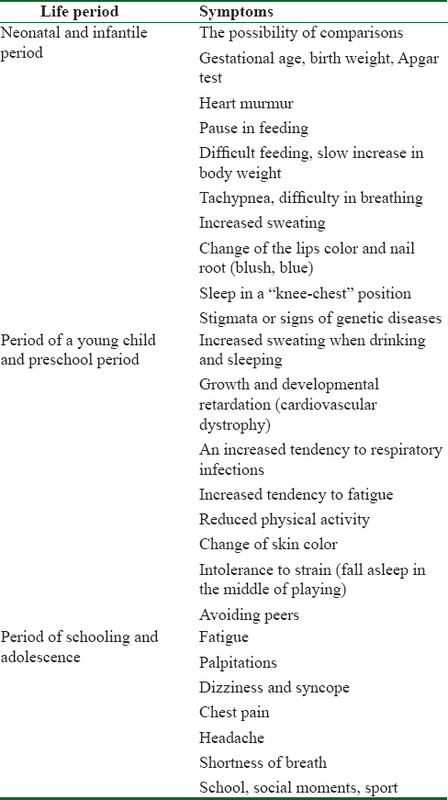 Pediatric cardiac anamnesis can be variable, completely negative, but very rich [Table 1].,, Anamnesis should, first of all, clarify whether a child is ill or it is considered as such by his or her environment. Preschool and school-age children are normally attending anamnesis. The main symptoms of cardiovascular diseases (CVD) involve cardiac insufficiency, signs of cardiac arrest, cyanosis, and syncope. The three basic symptoms of cardiac insufficiency in children are cyanosis, dyspnea, and edema, which ultimately, as well as the rest are not strictly specific to CVD. Anamnesis is always started with family history, i.e., issues related to the general health of a child's mother (diabetic cardiomyopathy, systemic lupus-congenital atrial obstruction, epilepsy, antiepileptic therapy, progesterone–estrogen therapy can reflect on the fetus). Also important is anamnesis pregnancy in relation to the possible teratogenic factor in the organogenesis phase, and later in the fetal period, whether it is a physical, chemical, biological, medication factor, pregnancy bleeding, trauma, and similar. The most common biological factors affecting the fetus are viruses. In case of rubella, we noticed more frequent appearance of patent ductus arteriosus, pulmonary stenosis, as well as the effect of other viral infections such as herpes, cytomegaloviruses, AIDS, and Coxsackie B viruses. Mothers' habits in the form of smoking, drinking alcohol, or taking drugs are also cardiotropic. In the history of the neonatal period, important information are birth weight, Apgar score and heart rate verification. In the postnatal period, comparison with previous children is important, as well as tachypnea, pauses in feeding and skipping meals, changes in the color of the skin of the lips and the root of the nail, or sleep in the knee-chest position, as well as excessive sweating, which correlates with anomalies of the left-right shunt. During this period, the most common diagnostic problem is to determine the cause of heart disease and/or cyanosis (hypoxia). The anamnesis of the preschool child is primarily a response to the issue of growth and development (slowing growth and development, activity, intolerance to strain, recurrent hypoxemic seizures, cyanogenic anomalies, skin color). In adolescents and young adults, information about school, social moments, sports, shortness of breath, fatigue, headaches, precordial pain, or chest pain is telling us a lot [Table 2].,,,, As already mentioned, three main symptoms of heart failure such as dyspnea, cyanosis, and swelling with recurrent respiratory tract infections, recurrent hypoxemic episodes, and cardiac syncope are very worrying symptoms and are not exclusively related to individual stages of growth and development. Seriousness and ultimately the lack of timing of the diagnosis are confirmed by the finding of secondary signs of hypoxia of the fingertips of the hands and feet (nails like hourglasses), gingival hyperplasia, expanded conjunctival lip, and nasal mucosa with congestion as well as the occiput, throat, and ocular background. The occurrence of cardiac arrhythmias with the localization of pulsation, ictus, hyperactivity of the pericardium, as well as the symptoms of the arteriovenous system are often observed in parents and even older children (palpitations, dizziness, dizziness, loss of consciousness, convulsions, hemiparesis, paresthesia, spasms, pulmonary ulceration, itching, eczema, systemic elevation of body temperature, petechiae, etc.). The general appearance of the child, the position and mood of the child, the metabolism of the child, the somatic and psychological status retardation, the disparity between the upper and lower part of the body, as well as certain stigmata must be noticed in taking anamnesis or heteroanamnesis. Changes of skin color, elasticity, body temperature, vein drawing, pulsations, nodes, xanthoma, bulged jugular veins, thyroid enlargement, telangiectasia, Osler nodes, Janeway lesions, splinter hemorrhage, and hyperhidrosis of nails are clinically significant signs that can be easily noticed. When some change in the heart is diagnosed, it is very important, if it is a case of acquired anomaly of the heart, to take detailed anamnestic data that refer to the previous streptococcal infection, its treatment, and possibly any allergy to drugs, contrast, and food. In case of these anomalies, it is important to explain to parents the nature of the anomaly, its consequences, and also the purpose of diagnostics and therapy, including invasive diagnostics and its risk., Anamnesis that is taken on the right way and a quality-based differential diagnosis based on anamnesis can significantly affect the cost of treatment as well as the overall health system savings. Comprehensive anamnesis must be the first and unavoidable step in any treatment of a patient, as such can be of great significance in the treatment of the patient. Anamnesis can keep the patient at one level of health-care system, with a strict focus primarily on the diagnostic process and possibly the treatment. A large number of patients in specialist and subspecialist clinics can be reduced by proper screening and by developing primary health-care system (from the local health-care center). Making high-quality medical history, the primary focus has a strong educative character for young doctors at the beginning of their careers. Regardless of the development of diagnostic methods, which are the tools of each physician, the medical history of anamnesis is still the essence of each clinical examination and represents the basis of the medical activity itself. High-quality, comprehensive medical history can keep the patient at one level of health care, with a strict focus primarily on the diagnostic processes, reduce crowds in specialist and subspecialist institutions, and make economic savings. Thaulow E, Lindberg H, Norgård G, Lunde P, Hals J. Long-term follow-up of patients with congenital heart defects. Tidsskr Nor Laegeforen 2000;120:684-6. Moody LY. Pediatric cardiovascular assessment and referral in the primary care setting. Nurse Pract 1997;22:120, 123-6, 128-9. Greenwood RD. The cardiac examination in children. Am Fam Physician 1985;31:105-16. Begic Z, Begic E, Mesihovic-Dinarevic S, Masic I, Pesto S, Halimic M, et al. The use of continuous electrocardiographic holter monitoring in pediatric cardiology. Acta Inform Med 2016;24:253-6. Behera SK, Pattnaik T, Luke A. Practical recommendations and perspectives on cardiac screening for healthy pediatric athletes. Curr Sports Med Rep 2011;10:90-8. Lock EJ, Keane FJ, Perry BS. Diagnostic and Interventional Catherization in Congenital Heart Disease. Boston, Dordrecht, London: Kluwe Academic Publishers; 2001. p. 5-9. Begic Z, Dinarevic SM, Pesto S, Begic E, Dobraca A, Masic I, et al. Evaluation of diagnostic methods in the differentiation of heart murmurs in children. Acta Inform Med 2016;24:94-8. Begic E, Begic Z. Accidental heart murmurs. Med Arch 2017;71:284-7.